We are thrilled to team up with the High Noon to present the following shows! 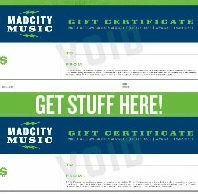 You can enter to win free tickets to all “MadCity presents” High Noon shows every time you stop by the store, no purchase necessary! Look for the entry box by the register!